Hello! It's time for a new Mojo Monday sketch (#196).. I hope you will join us this week! This week's sketch is so versatile.. it can be used to make a Clean & Simple card or you can dress it up! Instead of the oval, I stamped the Sweet Scallop Tag onto a sheet of patterned paper and die cut it using the matching Sweet Scallop Die. The hanging flower and sentiment, Wishing You Were Here, are from Always on My Mind. Accessories: Sweet Scallop Die (Verve), Circle and Square punches (EK Success), Corner Chomper (We R Memory Keepers), Markers (Copic), Flower (Prima), Gem (Hero Arts), Seam binding, Divine Twine, Foam tape, Thread, Sewing machine. Love the pop of colors and paper! Wonderful rich color and beautiful card! Such a fabulous card! Love the papers and the zigzag around your circle element. 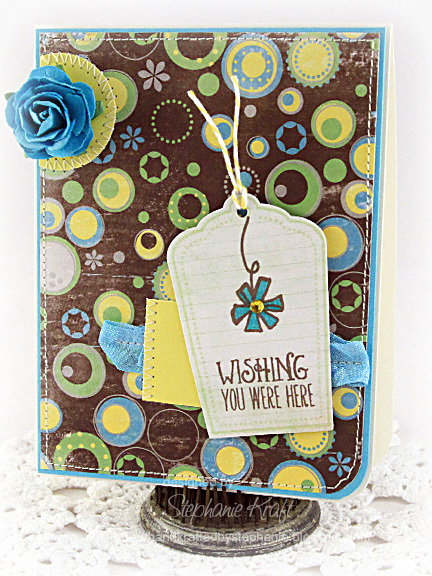 Love this bright card, Stephanie!! Great use of the tag & that paper is fantastic!! Cute card Stephanie! Love that tag and pretty turquoise flower! Thanks for the inspiration! Great card. Love the stiching and that blue flower in the corner. Perfect.